I thought it would be fun to show you my gallery of thrifting regrets today. Nothing says a “fun read” like the word regret. Ha! 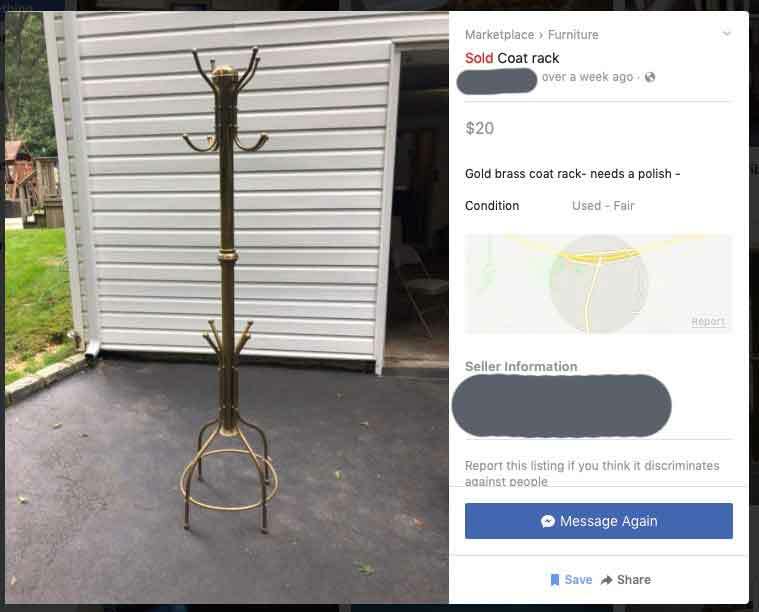 Do not even get me started on how much I loathe Facebook, but I do find its Marketplace to be quite useful when I’m thrifting for something in particular. It’s where I found my quirky rattan swivel chair. I still am over-the-moon about that chair, by the way. I like to ‘save’ items I’m interested in buying, but not motivated enough to leave my house that day to collect. Sometimes I watch the items to see if the price drops, but often the items are sold rather quickly and I miss out. Inevitably, I feel a pang of regret over these thrifted items that got away. Not enough of a pang to change my behavior though. Here are some items I probably should have bought on Facebook Marketplace, but didn’t. 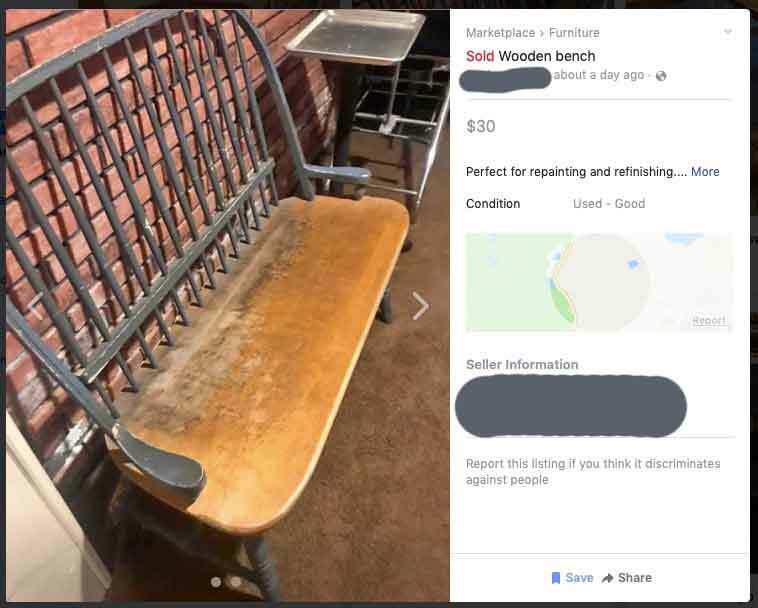 I need another bench like a I need a hole in the head, but this one would have been SO AMAZING repainted. Can you picture it? It would have looked great in virtually any color. Assuming it was sturdy, $30 is a steal. Don’t ask me why, but ever since I bought this brass clock, I’ve been obsessed with all things brass. These swans were huge and would have been fun in my house. I probably would have named them. So…maybe it is a good thing I didn’t purchase them. No need to make it awkward. Speaking of awkward, I’m in a quirky chair phase and have become obsessed with vintage leather contour chairs. I didn’t even know these existed until I moved to the East Coast and quite a few of them are for sale on Facebook Marketplace. I’ve seen the prices range from $80 to $1,000! It’s crazy. This one I passed on because of price and color. I do love the green color, but it won’t work with my decor. If a blue one becomes available ALL BETS ARE OFF. I did pounce on this $20 coat rack as the finish was perfection. However, since I couldn’t pick it up the same day the lady sold it to someone else. That happens sometimes. I have never played poker. I don’t have any desire to learn how to play poker. Yet, this poker table called to me! 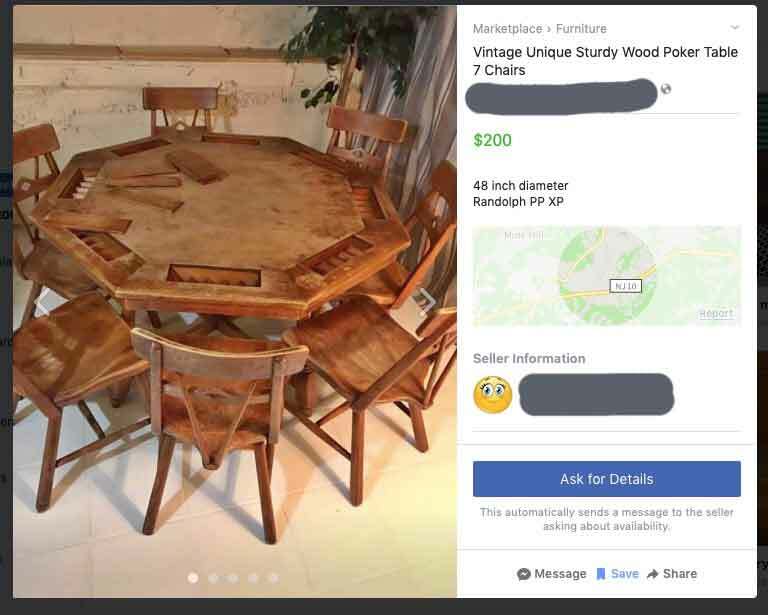 The chairs alone make this listing worth it. I figured we could use it as a ‘game’ table, but we have no place for it. 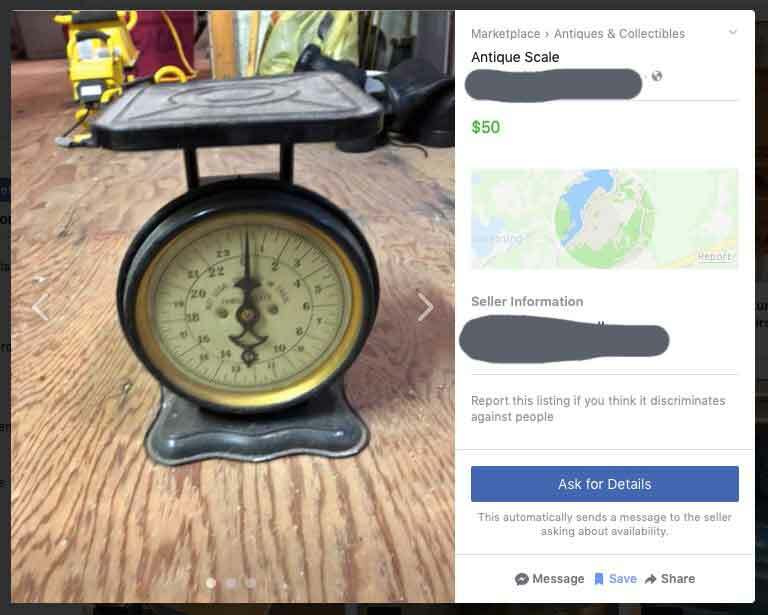 This antique scale also goes into the category or something I don’t need, but think is cool. Listings like this one always make me wonder if that’s the actual going rate? Is it priced fairly? If so, WOW! 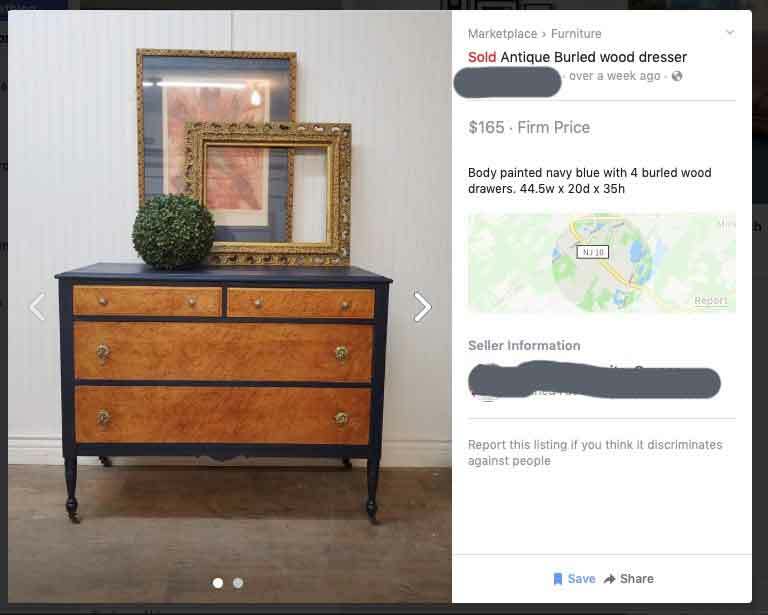 This dresser was clearly listed by someone in the business of refinishing pieces and selling them on Facebook Marketplace. $165 was more than I was willing to spend on a dresser, but I loved the wood drawers and the blue paint. Also, it’s what inspired my hunt for the $60 dresser I did end up buying. I’m sucker for those little wood wheels! 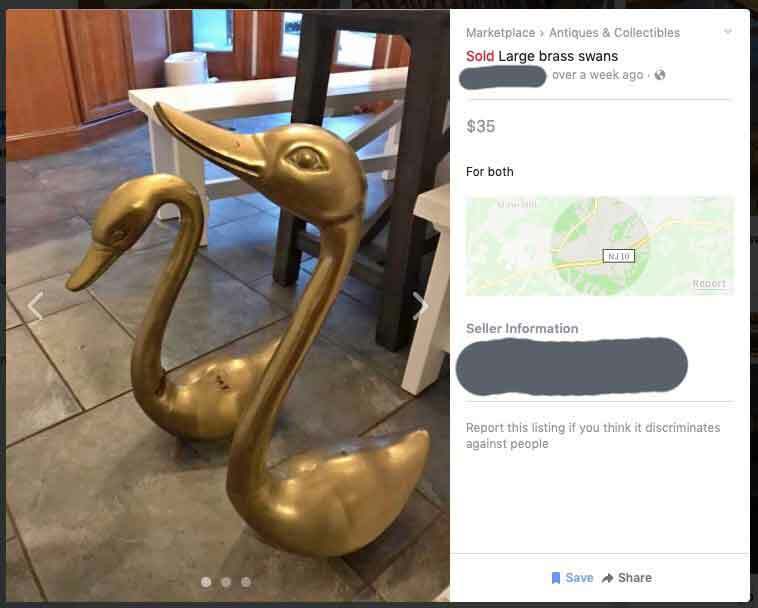 There are many more items in my “saved” folder on Facebook Marketplace, but I think you get the idea of the weird and amazing items that catch my eye. Do you have any thrifting stories of items you regret not buying? Or items you regret getting rid of? Happy Thrifting, everyone! May timing, luck and the thrill of the chase be on your side! If I haven’t said it lately, thanks for hanging out with me! Here are some other posts you might enjoy. I use to have some jadite coffee cups. I got rid of them a few years ago. Now I want just one. When I finally found some, they were $20—each. I don’t want one that bad. I’ll keep looking. If I don’t find one, I can live without it. I’ll have to keep a look out for these cups! Maybe I’ll find some that would make it worth the shipping. I can’t think of anything I passed up or didn’t buy when I really wanted it. I did find my hutch at a used store in Dallas several years ago and don’t regret buying it. I love the swans, dresser, green chair and the bench. 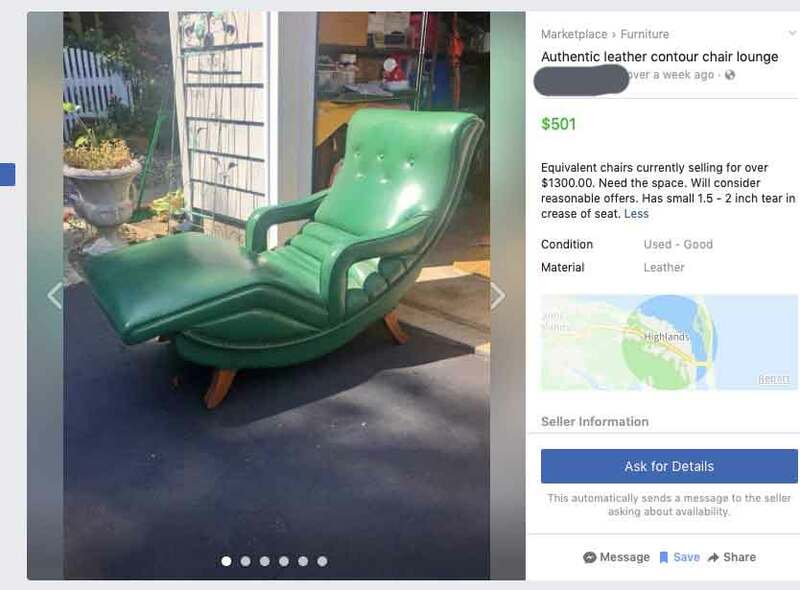 I would not want green but it looks so comfortable. I can vison using the bench in lots of places. I love shopping with you. You always go to such interesting places. See! I need to be more like you – carpe diem! Seize the day…or the treasure! Thanks for virtual shopping with me!